When we set out into the world of living in an rv full time, we brought four of our furry family members with us. Mind you, we were not insane - it is just that we had no choice! They had been family members since they were puppies and kittens and they were all still with us when we decided to hit the road. Our travel trailer was crammed, to say the least. But what was even more amusing was their attitude change once on the highway. Sure, they ruled our lives in our bricks and sticks house. But on the road it only intensified. We weren't gone 10 hours a day anymore. Nope, they had our undivided attention 24/7, and they used this to their advantage. They now outnumbered my husband and me, 2 to 1, and they wouldn't let us forget it. The RV Cat And Dog As Copilots - See What I Mean? They Even Take Over The Motor Home Dashboard - Honestly! Why Gifts For RV Owners Cats And Dogs? Many who go gift shopping for rvers get stumped. It is understandable. You can't buy something large and, if you don't understand recreational vehicles, you don't know what they need. People who live in a camper fulltime are, indeed, a rare breed. However....their fuzzy little traveling pals are quite a different story! These pampered pets get the thrill of having their owners around, doting on them, around the clock. They get to travel to new places, are rarely ever bored and are quite the topic of conversation around the campsite. They are the perfect recipients of a gift, when their owners are just impossible to shop for. Many people hit the open road with their pets these days...and these folks love to show off their dog, while walking around the campground. So putting that doggie in a "king of the rv" t-shirt is perfect! Or when guests come to visit, why not bring a chuckle with a cute pet feeding bowl full of rving wit? The point is that buying an gift for the camper's pet is like buying the humans a gift. It will be used, treasured, enjoyed...and appreciated! Purrrfect RV Gift Ideas For Pets Are Personalized! In this article we will be showing you personalized rv pet gifts that are ready to go - from dog t-shirts to pet bowls, bumper stickers and more. All of these ideas are able to be customized...you can change the message, color, font, style - you name it! So if Fido the dog would look better with an "I'm Fido, TRUE King Of The RV" t-shirt, then go for it! RVers in general are always good for a laugh - and poking fun of the rv copilot is quite common (the one sitting in the passenger seat, with backseat driver directions given freely while tooling down the highway). Our dog Hannah is actually our rving copilot - she stands next to Jim the entire drive...even if all day. But sometimes even our cat, Spot, gets in on the action...as you saw in our photo above. See, rving pets are not your average dog and cat! Our life is never dull with Hannah and Spot. So why not an rv copilot shirt for the furry "backseat drivers" on board the camper? You will note the tees below have the RV letters stand for funny things - one is "really vocal" and one is "rarely vicious." You can have a "bowl" lot of fun with these pet bowls. They come in doggie or kitty sizes but, as you know, some dogs are very tiny and some cats (ahem), like OURS, are bigger than most dogs! For Those RVing With Cats, Like Us! RVing with cats is a, um, unique experience in and of itself. 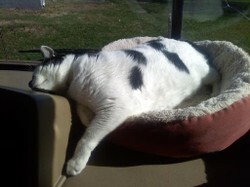 We believe that our cat thinks the rv is his own "kitty condo" on wheels. He wasn't like this in a bricks and sticks house - now we are constantly getting meow commands - like to get off HIS couch, move over on HIS queen size bed...you get the idea! Of course, with a little imagination you can create any gift idea under the sun for an rving cat or dog. Tote bags to hold their "stuff," pins, buttons, magnets or bumper stickers. During the holidays, you can create a stocking for the pet with some silly personalized accessories, treats and toys. Whether a big or small present or pet, honoring the true kings and queens of the rv will go a long way! When it is hard to know what to get an rver, switching gears over to the cat or canine is an excellent idea because they will actually use the gift. In addition, buying gifts for the rving cat or dog is fun and you might find yourself actually enjoying "shopping"...plus your own pet might convince you to make something for him or her while you are at it! Nothing like pet guilt trips, is there? Here are some other rv gift articles you might like! frugalrvrs, Cat and dog companions having their own tote bags particularly sounds appealing and tidy. And many items are just variations on what would normally be brought along, so no extra space is needed.